I’ve always hated getting wet. So, needless to say, when I woke up this morning to a wet, gloomy Paris, I promptly rolled over and went back to sleep on the grounds that I was still fighting off jet lag. Around 11:30, I finally mustered up the energy to peer underneath the blinds of the floor to ceiling windows in my hotel room. It was still a little gloomy, but at least it had stopped raining. While the sky was still heavy with clouds, the temperature was pleasantly in the mid-60s. I was actually a little warm in my lightweight sweater. I noticed, however, as I made my way though the Île de la Cité towards the Latin Quarter, the French were bundled up like it was the dead of winter. While a few of their heads were topped by the stereotypical berets, the ubiquitous French scarfs were everywhere. It made me wonder what they’d be wearing when it got really cold next week. 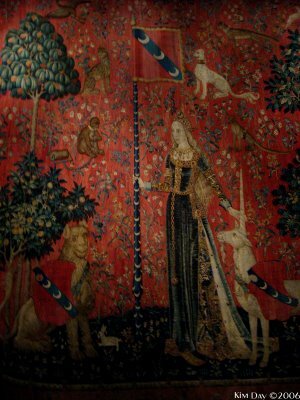 My first stop after lunch at a Crêperie, was the Cluny Museum (aka the Musée National du Moyen Age), home of the famed Unicorn Tapestries. 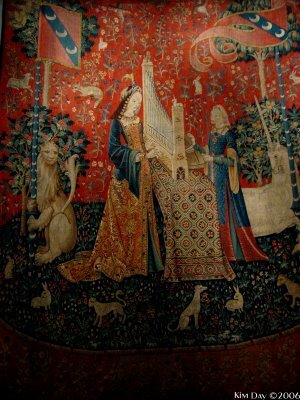 The 6 tapestries which were likely created in the late 1500s are amazingly well preserved, considering they were not discovered and put on display at the Cluny until some time during the late 1800s. (They are much better preserved than the Unicorn Tapestries found at the Cloisters Museum in New York City). The tapestries are rich in symbolism. The first five tapestries represent the five senses: sight, hearing, smell, taste and touch. The 6th in the series has been the subject of debate, and is know as “A Mon Sevl, Desir” (my only desire) and thought to be an apology of sorts for free will and self control. 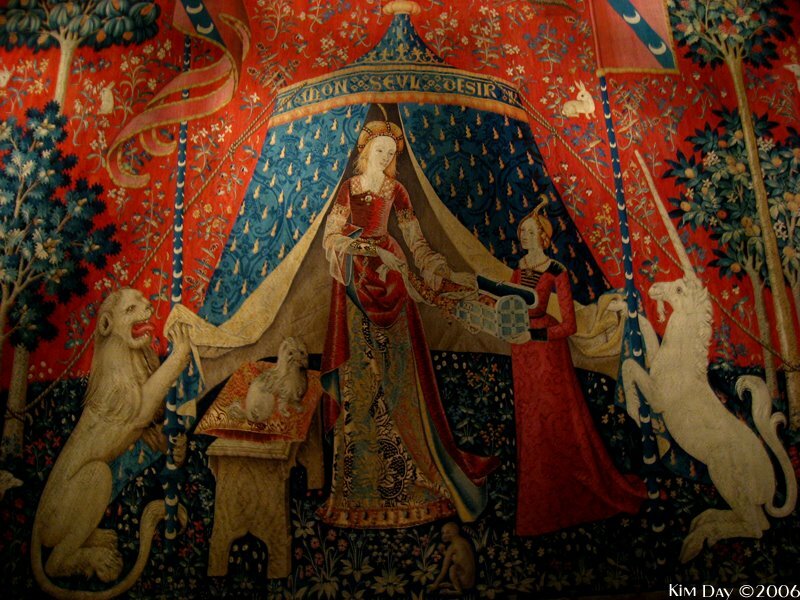 The Lion in the tapestries is said to be representative of the town of Lyon where a family know as Le Liste lived who may have commissioned the tapestries. 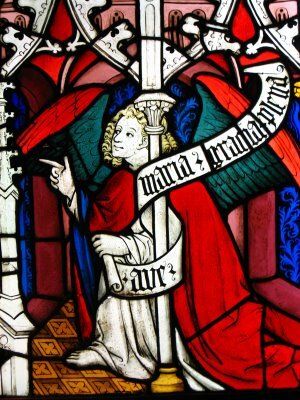 The Unicorn is said refer to the family name which in old French was “viste” (meaning fast) and the Unicorn was a representation of speed. 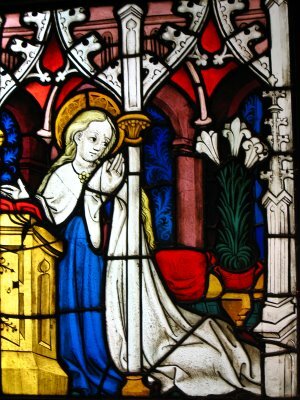 While the lion and unicorn are meant to be “standard bearers”, much has also been written about the relationship between the Lady and the Unicorn. Legend holds that only a virgin could tame a unicorn. 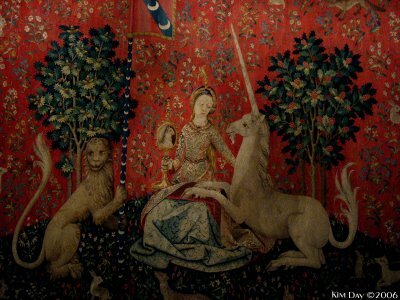 And some say that the unicorn has a dual purpose–to serve as an apology for beauty and desire as well as a distancing device in the pleasure of the senses (of which the 6 tapestries depict). 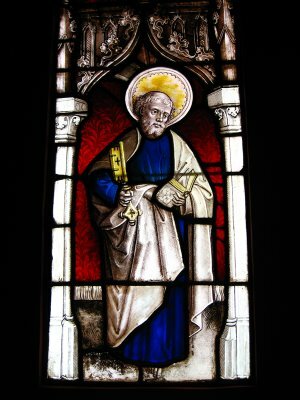 While the Cluny is know most for it’s Unicorn tapestries, it also holds one of the most prominent collections of stained glass in France. 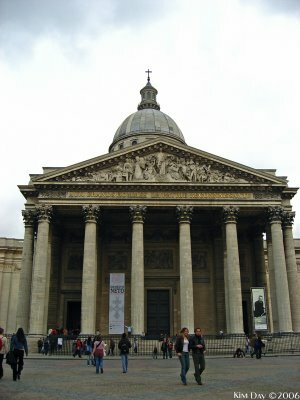 Once I had my fill of medieval history, I set off for the Pantheon in the heart of the Latin Quarter. The Pantheon contains the last resting place of Voltaire, Jean-Jacques Rousseau and Marie and Pierre Curie. It also contains a temporary exhibit of one of the oddest modern art installations I’ve seen in a while. The main chamber looks like it’s been covered in drooping white scrotums. 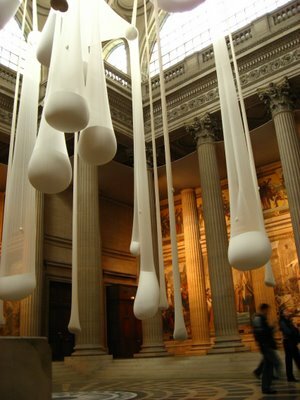 (I can’t help but wonder if this display means there are a number of Frenchmen missing their balls.) Apparently, it’s supposed to be some sort of celebration of Autumn. I’m sure one of the signs in French explained it, but my comprehension of French just wasn’t up to the task. I think in any language it was just weird. 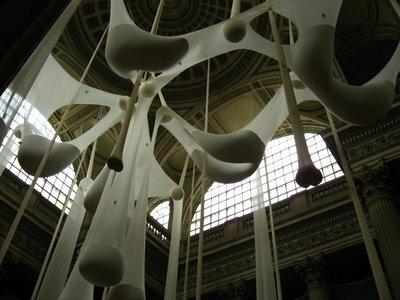 (According to Wikipedia, it was created by Brazilian Ernesto Neto and is called Leviathan Thot. Apparently it’s supposed to be some sort of monster and is on display until October 31st. If only I’d know I’d have waited a few days to visit). 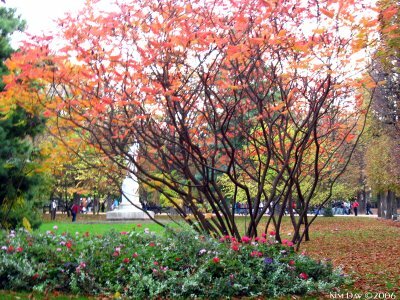 I wrapped up my afternoon in the Luxembourg Gardens. Despite it being nearly November, the flowers are still in bloom and the trees are just starting to turn colors. 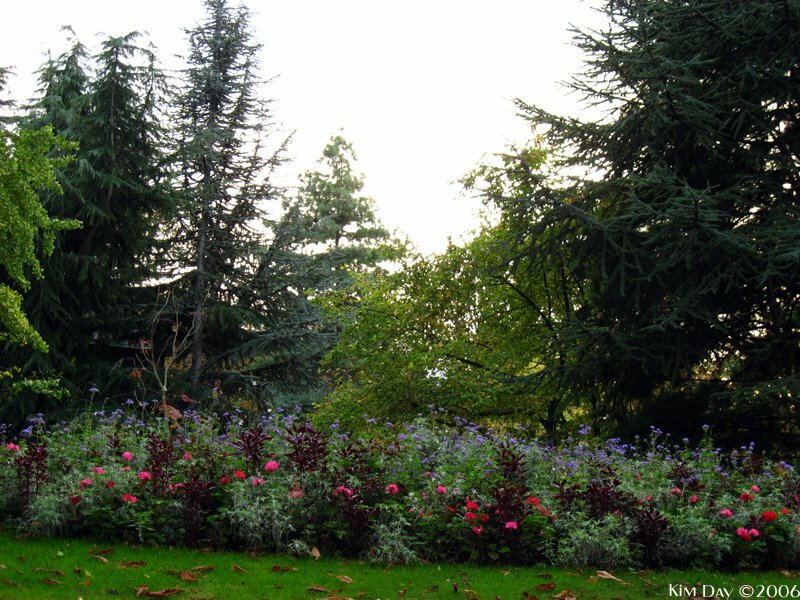 This fall afternoon, the Garden was packed with families. Click on the video view for a panoramic view. 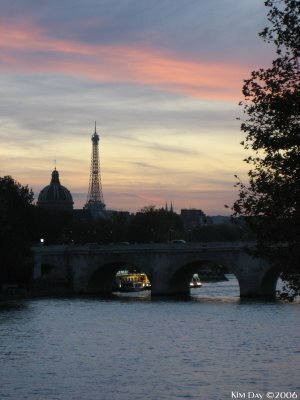 The days in Paris are ending earlier now; as in the US, daylight savings time ended last night. However, the sunsets are just as beautiful as ever. This entry was posted on Sunday, October 29th, 2006 at 3:08 PM. It is filed under France, Paris, Travel and tagged with Cluny, Luxemboug Garden, Pantheon, Stained Glass Windows, Unicorn Tapestries. You can follow any responses to this entry through the RSS 2.0 feed.